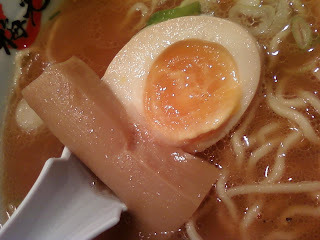 Mission the first - To hunt down the best bowl of Hakata ramen in Tokyo! Mission the second - To eat my way through as many "regional ramen styles" (gotôchi ramen) as possible! The first mission is pretty straightforward; there are plenty of shops in Tokyo serving the Northern Kyushu staple of white pork marrow soup and thin noodles, so someone's gotta find out who's got the best bowl. As for the second mission, the plan has grown more slowly. First I heard about Keizo from Go Ramen's epic ramen journey across Japan, sampling local ramen types I never even knew existed. Then I picked up a new ramen magazine listing a bunch of new openings of shops serving obscure regional ramen varietals in the metropolis, like Tsugaru ramen (at Nagi in Shinjuku) and Tsubame-Sanjô ramen (which I went all the way to Niigata to eat). My curiosity was piqued, and an idea began hatching. After finishing with ramen in Takadanobaba, I would make an effort to find and eat as many different ramen styles as possible, all without leaving Tokyo. This won't be the blog's main focus for a while yet, but that doesn't mean I can't start right now! I decided to start close to home, in Shinjuku, where you don't even have to leave the station complex to find a bowl of regional ramen. On the 7th floor of the Lumine EST department store is Baikôken (Plum Light House), a branch of a well known shop from Asahikawa. Asahikawa is located smack dab in the middle of the northern island of Hokkaidô, and is in the top tier of nationally known "ramen cities." Three years ago, I happened to pass through Asahikawa just in time for their annual summer ramen festival, sampling servings of some of the city's best bowls in the balmy night air. 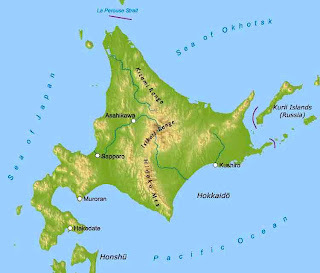 In addition to its ramen, Asahikawa is famous for having the best zoo in Japan as well as for its proximity to Daisetsuzan National Park, Japan's largest. 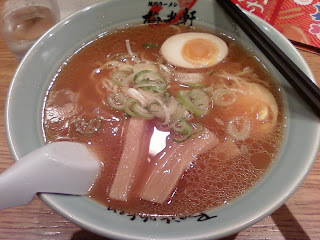 But at that time, I didn't know the first thing about Asahikawa ramen - I had it confused with Hakodate ramen of southern Hokkaidô, and figured shio (salt) ramen was the way to go in Asahikawa. But Asahikawa's home grown style is a shôyû (soy sauce) soup blended with a complex mix of northern marine products, both fish and shellfish. 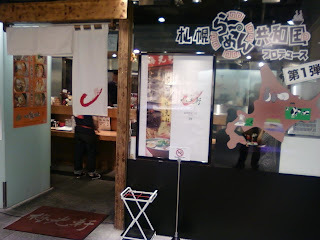 If you want a good overview of what Asahikawa ramen is all about, check out Keizo's recent shop reviews from his recent trip there. My understanding is that the lineage of today's "Asahikawa Ramen" originated with Hachi-ya in 1948, soon followed by Aoba in 1950. Perhaps the best known purveyor of Asahikawa ramen is Santôka, which has become not only a national, but an international chain, with popular branches in Los Angeles and New Jersey; but Santôka, while an Asahikawa ramen shop, does not serve "Asahikawa Ramen" in the traditional sense, focusing on shio broth famously topped with a tiny pickled plum. Baikôken's heritage isn't quite as long, but it's still got enough history to shake a stick at, first opening its doors back in 1969. Baikôken has since expanded as well, choosing its storefront locations with precision and opening branches in such major noodle towns as Tokyo, Sapporo, Hakata, and...Singapore? Baikôken also slings noodles in the Asahikawa and Sapporo ramen parks ("Ramen Village" and "Ramen Republic", respectively), and that's actually how Baikôken has found its way to Shinjuku - Sapporo Ramen Republic has rented a space in the restaurant floor of the Lumine EST department store, and for the next couple of years, various renowned Hokkaidô ramen shops are going to be cycling through at fixed intervals, which is an exciting prospect. 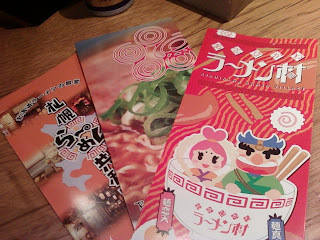 Baikôken is definitely milking its pedigree, aggressively advertising both their own heritage and the sales potential of Hokkaidô ramen in general, with tons of brochures on offer. So, how is Baikôken's ramen? To be honest, pretty basic. Visually, it strongly resembles a bowl of old school Tokyo ramen, with the classic old school toppings of menma (bamboo) and shredded green onions and a thin layer of oil across the top of the bowl to keep the soup piping hot. If the brown color is a bit lighter than classic Tokyo-style ramen, then so is the taste; rather than deliver a thick and strong soy-filled punch, the diluting seafood broth blend actually resulted in a soup that was a bit weak when it should have been pungent. Maybe they toned down the seafood for the mass market? I bet that the bowls at the original shop (honten) in Asahikawa are a different kinda animal. The egg was pretty standard, but the menma were better than average, thick and chewy two-by-fours of woody pickled bamboo. In perfect fairness, I was at the height of my head cold when I ate this bowl, so my taste buds were only firing at a fraction of their usual capabilities, and it's quite possible that Baikôken's ramen packs a much stronger punch than I'm giving it credit for. The thin, hot soup did wonders for my sinuses, but tastewise it turned out to be one of the more forgettable bowls I've had thus far. 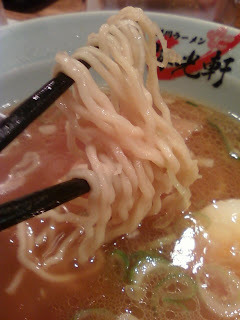 The noodles are pretty middle of the road as well, medium thick and medium curly, well-made but nothing outstanding. Baikôken does get bonus points for being one of the few ramen shops to furnish a student discount, which means that for once I'm actually saving money by skimping on the pork châshû. So, Baikôken may not have been an auspicious start to my new ramen ambitions, but that's not stopping me - stay tuned for lots more regional ramen reports! Yeah I regret not trying Baikoken in Asahikawa. I walked by it plenty of times but was just too full. You know what I also heard about Asahikawa Ramen? They first pan-fry and stew the pork bone in shochu. or maybe after reading my review you don't regret it? iiiinteresting about the shochu, I actually spotted a couple big bottles sitting by the stove in an old school tokyo-style place the other day. Hi Nate, I'm a Chinese Singaporean fan of ramen, and I've been searching for the best ramen shops in my country. I must say I agree with your review of Baikoken, though I reckon that the bowl of Tonkutsu miso ramen I had at Baikoken in Singapore recently was just plain disappointing. It was crude tasting and lacked finesse. Santouka Ramen is far superior in comparison, though its Toroniku pork cheeks and broth were too salty for my taste. @anonymous - yeah, how is the ramen in singapore?? i feel like outside of japan it might be one of the better places to find a good bowl. then again, there are so many other delicious noodle soups from the malaysian peninsula too... thats weird that baikoken is in singapore huh? ive actually never tried santoka, even though they also have a large presence in the states. one of these days... any other japanese shops have branches down there? There has been a growing number of authentic ramen shops opening in Singapore in the past few years, so the variety and standards are improving. But it's still far from the ramen heaven that is Japan. If you visit Singapore, I reckon you should definitely try the ramen at Noodle House Ken, Miharu, Menya Shinchan and Santouka Ramen. They are the best in Singapore! If you're a fan of Ippudo, then you'll be glad that they've opened a shop in Singapore too. Although a bowl of ramen will cost you a whopping 1,274 yen.